Hot hair care tools are certainly an asset when it comes to taming unruly locks and achieving the ultimate style. Though these tools can definitely help you get the look you want, too much heat can cause damage to your strands. Below, we’ll discuss how heat impacts the health of your hair and what you can do to minimize damage. Blow drying your hair removes moisture both at the surface level and within the strands, causing the cuticles to become dry or brittle. Later when you brush and style your hair, the flexing on the strands can cause serious breakage. Using a flat iron or curling iron can also cause damage to your hair. If you are using these tools on dry hair, you may cause cracking on the edges of the cuticles. Ironing wet hair can also cause damage as the quick release of moisture causes bubbling of the cuticle. This damage to the cuticle causes split ends and breakage. Apply hair care products that protect your hair from heat damage. Use a leave-in condition regularly to restore moisture to your strands. 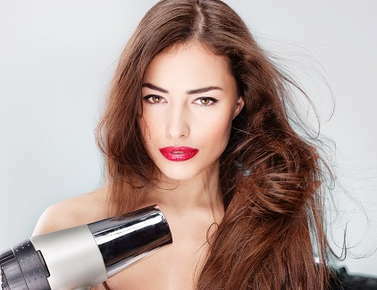 Select the lowest heat setting on your hairdryer or iron when styling. Work quickly and try to limit the time that the tools come in contact with your hair. Give your hair a few days off by trying a style that doesn’t use heat. Are you looking for heat damage help? Contact us today to make an appointment with one of our experienced stylists who can help you create a hair repair plan that will bring life back to your mane.